Access to a specialist hearing assessment and bespoke hearing protection. 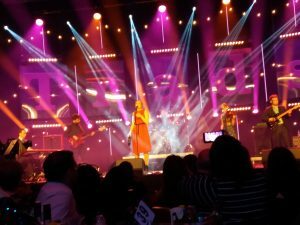 The Help Musicians UK survey in 2015 showed that 40% of respondents had experienced hearing loss, 50% were concerned about noise levels at work and 82% believed that musicians should use hearing protection. Help Musicians UK, in partnership with Musicians’ Hearing Services and the Musicians’ Union have created the Musicians’ Hearing Health Scheme for all musicians in the UK. The scheme gives all those working in the industry affordable access to specialist hearing assessments and bespoke hearing protection. A one-off payment of £40 (£30 for MU members) offers a range of services including an audiological assessment and ear check-up from a specialist in musicians’ hearing. XpoNorth festival based in Inverness is Scotland’s leading creative industries festival which this year takes place on 27th and 28th June. XpoNorth is the only festival of its kind in Scotland and includes crafts, fashion, textiles, writing and publishing; screen and broadcast; digital and technology and music. The festival includes a wide range of networking events, seminars, workshops, music and film showcases. As we do every year, Birnam will be closing our doors for a couple of weeks over the festive period so we can all take a collective breath and enjoy both Christmas and the New Year Celebrations. Our final day of 2017 will be Friday the 22nd of December and we will re-open at 9:00am on Thursday the 4th of January. We hope you all have a great time over the holidays and we look forward to working with you all in 2018. Help Musicians UK have launched a mental health support line and service for the music industry. Music Minds Matter is a support line and service, operating 24 hours a day, seven days a week, for the whole UK music community. Launched in December 2017, Music Minds Matter is the industry’s most comprehensive service yet – linking advice, signposting, clinical pathways and professional therapeutic services to Help Musicians UK’s (HMUK) traditional grants for musicians in need. You call also access Music Minds Matter by emailing, MMM@helpmusicians.org.uk (please note a 48-hour turnaround). 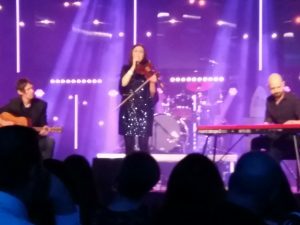 Now in its 15th year, the MG Alba Scots Trad Music Awards, this year held in Paisley, once again presented an incredible selection of wonderful performances from a wide range of hugely talented artists. 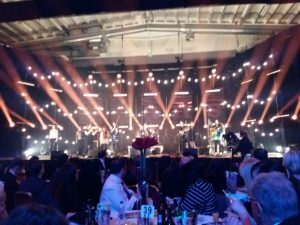 The event itself was held in the Paisley Lagoon Centre which, along with the very impressive lighting and sound, provided a spectacular, glitzy venue for the evening. The event kicked off with a powerful performance by The Shee Big Band, on great form with beautiful harmonies in their opening song followed by a foot-stompin’ instrumental set. Lori Watson, with a stunning vocal performance, confirmed just why her imminent new album “Yarrow Valley Sessions” is so eagerly anticipated (it’s in production now and will be available soon – honest!!). 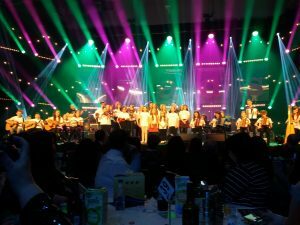 It was lovely to see the enthusiasm and talent shining from all the young folk of Fèis Phàislig who earned a highly enthusiastic ovation from the crowd in the hall. 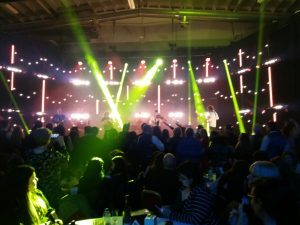 Ross Ainslie was the only solo act to take to the stage on the night, but his performance was every bit as powerful as the other acts on show – and made all the more powerful by the skilful and dramatic stage lighting. Considering the number of awards she has now won, Scots singer of the year Siobhan Miller must surely be in the market for a bigger mantelpiece these days. Her performance towards the end of the night showed just why she is so acclaimed, and her rendition of Andy M. Stewart’s classic “Rambling Rover” certainly had the entire assembly find its voice. The evening finished with a set by Inverness quintet Elephant Sessions, rounding off what has been an outstanding year for the band by getting the audience up on their feet to bring a great end to a truly special night. Thanks and congratulations to Simon Thoumire and the Hands Up for Trad team for once again putting together an incredible line up for the awards ceremony and well done to all of the nominees who made it to the final lists. 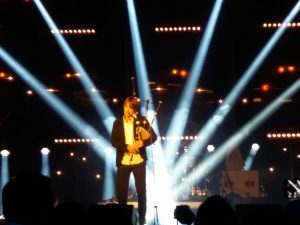 MG ALBA Scots Trad Music Awards 2017 – Voting closes 24th November. A total of sixteen awards will be presented at a glitzy award ceremony on Saturday 2nd December, at Paisley’s Lagoon Centre as Paisley bids for UK City of Culture 2021. Awards are also given for: Community Project of the Year, Composer of the Year, Live Act, Scots Singer of the Year, Up and Coming Artist, Music Tutor of the Year, Gaelic Singer of the Year, Folk Band of the Year, Dance Band of the Year, Scottish Pipe Band of the Year, Club of the Year, Instrumentalist of the Year, Event of the Year, Trad Music in the Media, Venue of the Year. To place your vote please visit: TradAdwards2017.